Nigel Lambert’s pots are both decorative and useful. He began his love of pottery and paintings whilst at art college in Cornwall. His interest in the work of abstract painters, particularly Roger Hilton, Terry Frost, Patrick Heron and other artists from the Cornish peninsula has influenced his work and the decorative marks he makes. 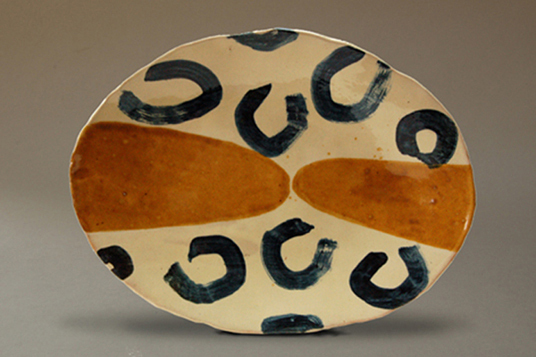 His work is approached not as a painter, but as a potter. Clay is the starting point. After the pots are thrown or pressed from flat sheets of clay, these are cut and re-formed into ovals and square forms. They are dipped in a white clay slip, dried and then glazed, this produces a flat white surface on which the blue oxides are painted, with new and old brushes, odd bits of sponge and fingers. Lines and motifs are often scratched through the blue, adding and extra depth of image. Historic pots and potters have been a strong influence on Nigel’s approach to ceramics. From the warm colours of old french and spanish peasant ware, the fine brush work of Delft pottery; to more recent potters such as Michael Cardew, Peter Smith and American potter Jeff Oestrich. Nigel Lambers trained at Cornwall College and with Roger Cockram at his north Devon pottery. He established his first workshop in Bristol in 1987, this lasted until 1990 when he moved to the Forest of Dean, where he currently lives and works. He has exhibited widely in England and Europe and was elected a fellow of the Craft Potters Association in 1990. Wobage welcomes Nigel for a day of demonstration and tutorial during the 5 day Jug-making course in 2012. More information on Nigel’s website.